You can make Libevent developers happy by reducing our wishlists! Thanks to AppNexus for sponsoring Libevent development in 2012! libevent is meant to replace the event loop found in event driven network servers. An application just needs to call event_dispatch() and then add or remove events dynamically without having to change the event loop. Currently, libevent supports /dev/poll, kqueue(2), event ports, POSIX select(2), Windows select(), poll(2), and epoll(4). The internal event mechanism is completely independent of the exposed event API, and a simple update of libevent can provide new functionality without having to redesign the applications. As a result, Libevent allows for portable application development and provides the most scalable event notification mechanism available on an operating system. Libevent can also be used for multi-threaded applications, either by isolating each event_base so that only a single thread accesses it, or by locked access to a single shared event_base. 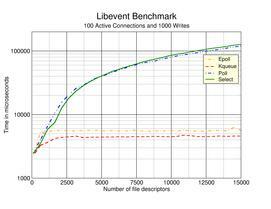 Libevent should compile on Linux, *BSD, Mac OS X, Solaris, Windows, and more. 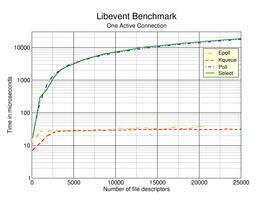 Libevent additionally provides a sophisticated framework for buffered network IO, with support for sockets, filters, rate-limiting, SSL, zero-copy file transmission, and IOCP. Libevent includes support for several useful protocols, including DNS, HTTP, and a minimal RPC framework. More information about event notification mechanisms for network servers can be found on Dan Kegel's "The C10K problem" web page. A mailing list for libevent is now available. Libevent is maintained by Nick Mathewson, Azat Khuzhin and Niels Provos. What's new in: 2.0.x-stable 2.1.x-alpha. These are the ones you probably want for software development, unless you like to track the latest development versions and report bugs in them. Several SSL correctness and performance fixes. Fix a crash on windows. Other bugfixes for http, memory management, and cleanup. This is a release candidate. If you find any bugs, please let us know! This is alpha code. If you find any bugs, please let us know! Several new utility APIs in libevent core, bufferevents, and evhttp. Detect closes early with EPOLLRDHUP. (Optional) support for buildint with cmake. Bugfixes too numerous to mention. New finalization API with fix for bufferevent deadlock issue. New evdns and evhttp option. Bugfixes and portability fixes and build fixes too numerous to mention. Even more backends can now use portable monotonic timers. Updated autotools build infrastructure for faster builds. First alpha release in the 2.1.x series. New evbuffer functionality, including an improved sendfile/mmap wrapper, the ability to add one evbuffer to another, and more ways to avoid needless copies. Numerous small performance improvements and data structure tweaks throughout the codebase. Libevent has been released under a 3-clause BSD license. Information on public git access. Performance comparison using different event notification mechansims in Libevent. We declare interest in a large number of connections of which most are cold and only a few are active. The benchmark measures how long it takes to serve one active connection and exposes scalability issues of traditional interfaces like select or poll. The benchmark measures how long it takes to serve one hundred active connections that chain writes to new connections until thousand writes and reads have happened. It exercises the event loop several times. Tor – an anonymous Internet communication system. redsocks – a simple transparent TCP -> Socks5/HTTPS proxy daemon. Honeyd – a virtual honeynet daemon – can be used to fight Internet worms. Disconcert – a Distributed Computing Framework for Loosely-Coupled Workstations. Trickle – a lightweight userspace bandwidth shaper. watchcatd – software watchdog designed to take actions not as drastic as the usual solutions, which reset the machine. ScanSSH – a fast SSH server and open proxy scanner. Nttlscan – a network topology scanner for Honeyd. NetChat – a combination of netcat and ppp's chat. Io – a small programming language; uses libevent for network communication. Systrace – a system call sandbox. SpyBye – detect malware on web pages. GreenSQL – an SQL database firewall. Kargo Event – a PHP extension for libevent. Scytale – a database encryption tool.